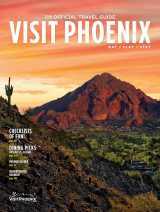 PHOENIX (April 11, 2013) — Users of the iPad now have the Official Travel Guide to Greater Phoenix at their fingertips. Available as a free download in Apple’s App Store, the Visit Phoenix application takes users on a virtual journey through America’s sunniest metropolis using photos, videos and helpful links. The app contains insider content about things to do and places to dine in Greater Phoenix, and provides first-time visitors with overviews of the metro area’s most-visited communities: Scottsdale, Tempe, Glendale, Mesa, Cave Creek/Carefree, Chandler and Queen Creek. The Visit Phoenix app includes an article on Greater Phoenix chefs who have achieved TV fame, as well as a Q&A with Phoenix resident (and NASCAR star) Danica Patrick. The app also features an events calendar, a weather chart and tips on getting around town.